A couple of weeks ago I decided to make some granola. I’m not really a cereal girl but I do love granola! I had been craving it but didn’t want to pay the high prices at the store. I’m not sure why but granola tends to be pretty expensive. So I when on Pinterest and found a recipe to try. You can check the original recipe here. I decided to tweak it to what I like and what I generally have on hand. When it comes to granola I like to keep it simple. I hope you enjoy my recipe! Mix dry ingredients together. Add in the honey/water mixture and stir well. Once the dry ingredients are coated well with the honey add in the olive oil. Mix well. Spread out evenly on a cookie sheet that is lined with parchment paper. 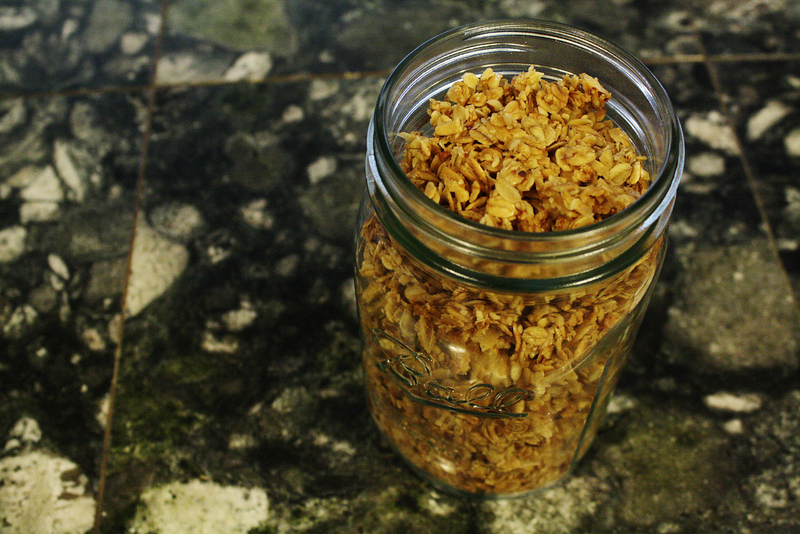 You will bake the granola for 1 hour stirring every 20 minutes or so to make sure it browns evenly. After the hour let cool (the granola will get even crunchier after it cools). Store in an airtight container. This thing about granola is that you can tweak it to whatever you love. Try adding different nuts, sesame seeds, raisins or other dried fruit. Previous Post Taylin’s Bedroom…Time For An Update!